Even as tourism growth in Singapore is expected to slow in the next decade from the previous brisk pace, the industry will still turn in a perfectly respectable performance when it closes the door on 2013. Visitor arrivals appear to be exceeding the conservative estimates set this year, though it remains to be seen if tourist spending will follow suit with a proportional increase. Hotels continued to fill rooms at robust occupancies, while other operating indicators - such as the average room rate (ARR) and revenue per available room (RevPAR) - dipped from last year's record levels in the face of increased supply, a strong Singapore dollar and weaker corporate demand. According to preliminary estimates from the Singapore Tourism Board (STB), visitor arrivals for January to October hit 12.92 million, up 8.4 per cent from the previous year, suggesting that STB's target for this year of 14.8-15.5 million may have been on the cautious side since Q4 is typically bolstered by the year-end festivities. This also means that Singapore is well on track to hit a long-established target of 17 million visitors by 2015. However, tourist spending is an equally (if not more) important metric for the industry. Q1 data from STB showed that while arrivals were 9 per cent higher at 3.9 million, spending slipped 6 per cent to $5.7 billion from the corresponding quarter a year ago on weaker gaming revenue and a 6 per cent drop in business travellers (BT) and MICE (meetings, incentives, conferences and events) arrivals. Spending by BTMICE visitors fell 20 per cent that quarter. Q2 and Q3 figures have yet to be released. "Industry feedback indicated that businesses were cutting down on trips and associated budgets, which led to a drop in spend across all components (in Q1 2013), including accommodation, F&B and shopping," said STB communications director Oliver Chong, adding that other regional markets also suffered declines in BTMICE arrivals that quarter. Last year, Singapore attracted 14.4 million visitors who spent $23 billion in tourism receipts. STB is expecting tourism receipts to hit $23.5-24.5 billion this year. After a decade in which tourism growth shifted into high gear, the rate is expected to essentially halve over the next decade, the government said earlier this year. From 2002 to 2012, tourism receipts surged at a compound annual growth rate (CAGR) of 10 per cent while arrivals increased at a 6.6 per cent CAGR. Still, DBS Vickers analyst Derek Tan expects visitor arrivals to continue on an upward trend into next year, underpinned by a healthy outlook for travel in South- east Asia and a strong pipeline of MICE events which include the 2014 Singapore Airshow. For 2013 as a whole, he projects spending of $24 billion by a total of 15.5 million tourists. "We expect visitor arrivals to grow 6 per cent year-on-year to 16.3 million in 2014," he said. This year, the River Safari joined the growing list of tourist attractions which the Republic has to offer, while the Kallang Sports Hub will host a number of major sports events when it opens its doors next year. 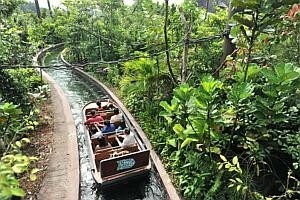 Since its soft opening in early April, more than 500,000 people have visited the River Safari, of which a third were tourists, though Wildlife Reserves Singapore expects the percentage of tourists to rise in coming months. The River Safari will have its official launch in Q1 next year, after the Amazon River Quest boat ride started operating this month. "We targeted 600,000 visitors in the first year," said Lee Meng Tat, chief executive of Wildlife Reserves Singapore, adding that he expects higher visitor numbers next year. The sixth edition of the Singapore Formula One (F1) Grand Prix in September also brought in more tourists this year. Race promoter Singapore GP (SGP) scored a ticket sales tally of some 87,500 - the highest since the inaugural race in 2008 when 100,000 tickets were snapped up - as more spectators travelled here for the night race. "New attractions allow us to expand our offerings to inbound travellers, cater to various segments of the market, draw new and repeat travellers, move consumers up the value chain and reap in higher- yield travellers," said Chan Brothers spokeswoman Jane Chang, who estimates a 10 per cent increase in bookings for the travel agency this year over 2012. "That said, there is also a ceiling to how long we can stretch a tourist's stay in Singapore despite the bells and whistles of the new attractions." Hotel occupancies have more or less held firm this year, while a slight decrease in room rate translated to a corresponding decline in RevPAR. STB's preliminary statistics for January to October showed occupancies at 87 per cent, while ARR dipped 1.1 per cent to $258 and RevPAR to $224. In segment terms, luxury hotels were the only category to post an increase in RevPAR, up 9 per cent. RevPar declines were seen in upscale (-12 per cent), mid-tier (-3 per cent) and economy (-8 per cent) hotels, likely caused by a double whammy of increased supply and weaker corporate travel demand. According to CBRE Hotels, the hospitality sector will end the year with an ARR of $255-260 and an average occupancy of 86 per cent, translating to a RevPAR of $220-225. This suggests rates and RevPAR could slip very slightly from the $257 and $222 respectively seen last year, while average occupancy will stay flat. Similarly, Cushman & Wakefield estimates that rates and RevPAR will both dip 0.5 per cent year-on-year, while DBS Vickers projects ARR and RevPar at $254 and $221 this year. "It's what we expected it to be - a little softer from last year," said CBRE executive director Robert McIntosh, noting that hoteliers are having a tough time pushing up room rates further. In addition, the growth in visitor arrivals is outpacing the 4-5 per cent increase in the number of room nights sold, which suggests travellers could be staying shorter periods, possibly because of the strong Singapore dollar relative to regional currencies as well as the nation's push to position itself as a destination for quality tourism. "Market-wide room rates experienced slight downward pressure year-to-date due to increasing competition from newly opened hotels which are offering preferential room rates," added Akshay Kulkarni, regional director (hospitality) at Cushman & Wakefield. Properties which came onstream this year include the Westin, Parkroyal@Pick-ering, the Ramada and Carlton City Hotel. New hotels opening in 2014 include Sofitel So, the Patina as well as the Holiday Inn Express at Havelock. By CBRE Hotels' calculations, some 3,500 new rooms will have launched by year-end - adding to the industry's supply of 51,620 rooms as at end-2012 - with more than 1,000 from the economy segment, 1,400 from the mid-scale segment and the rest from the luxury segment. Next year, some 2,900 rooms will be added from largely the economy and mid-scale segments, which could put pressure on occupancies in these two categories, cautioned Mr McIntosh. Despite the stiffer competition from the supply injection, both CBRE Hotels and Cushman & Wakefield reckon the pipeline of rooms will be well absorbed and are unlikely to lead to a supply glut. Said Mr Kulkarni: "Although the 2013-14 increase in room supply is size- able at around 6,600, we think the pressure on room rates is going to be a short-term phenomenon and that rates will pick up in the second half of 2014." DBS Vickers' Mr Tan is similarly upbeat for next year, with projections of a modest improvement in performance to $260 for ARR and $226 for RevPAR.